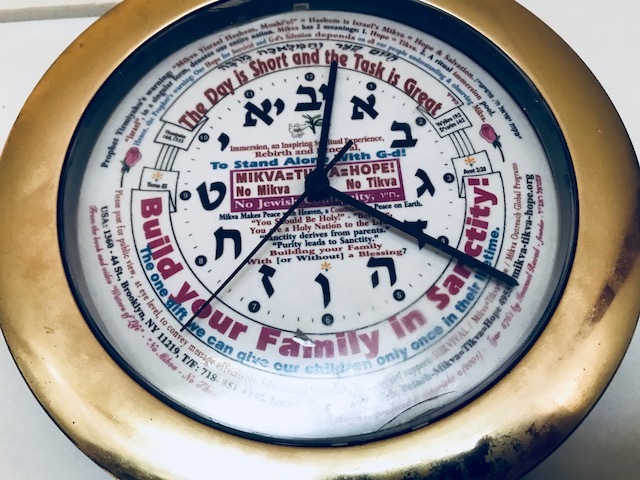 I thought this was a really special Jewish clock I saw in the store yesterday. It promotes holiness and sanctity in the family. Rebirth and renewal (from the immersion in the holy water). Build your family in sanctity! The Jewish laws of refraining from sexual relations during Nidda (a women's menstruation) and of immersing in the mikvah at the end of the cycle and before the husband and wife coming back together physically are cornerstones of acting with self-control and a couple dedicating themselves to Hashem first. The family is the core of raising and educating our children and of the makeup of the community and ultimately of serving G-d in everything we do. Self-control (with sexual purity, kosher food, Sabbath time, etc.) is what separates us from animals and how we emulate being more like the angels. It is also a way for a husband and wife to elevate their love and show respect for each other as human beings and not just physical beings. I never saw a clock that reminds us of these holy concepts and laws like this. "The day is short and the task is great." Another good reminder to maximize the use of our time every day here on Earth and to make the most out of every moment.